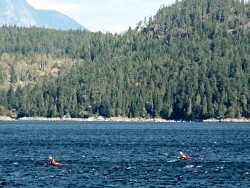 A short ferry ride across Discovery Passage from downtown Campbell River, on Vancouver Island, to Quadra Island is all it takes. Passengers disembark to an idyllic island playground of beaches, lakes, and parks intermingled with luxury lodges, native culture, artisan's studios, and other interesting places that are friendly and welcoming. Spanish and English explorers sailed through the region in the late 1700's while trying to thread the maze of islands and dangerous currents and channels that guarded the top end of Georgia Strait. Many thought one of these waterways would lead to the fabled Northwest Passage and a quick route from the Pacific to the Atlantic Ocean. They met and traded with the local Salish and Kwagiulth First Nations, whose ancestors live at Cape Mudge on south Quadra Island. Today, visitors to Quadra Island can experience native artistry and traditions at the Kwagiulth Museum in the Village of Cape Mudge. A collection of old totem poles inspire many of the modern artists whose work is featured. 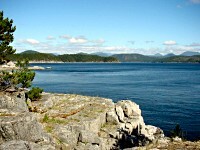 Quadra Island is also home to many well known contemporary artists, writers, potters and other artisans, and a growing community of Healing Arts practitioners. One of the best known of Quadra Island's many beaches is Rebecca Spit Provincial Park near Heriot Bay. 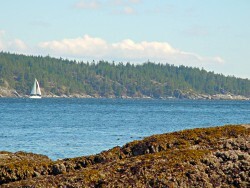 The sheltered bay is a picturesque anchorage for yachts exploring the Discovery Islands and Desolation Sound. 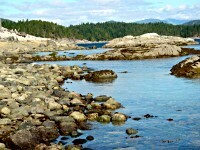 The rich waters that surround Quadra are fed by large tidal exchanges and nourish abundant marine life. That makes for great fishing and excellent diving; considered one of the top locations in the world by the Jacques Cousteau Society, there's even an artificial reef, the HMCS Columbia, just waiting to be explored.